When it comes to wine, I generally gravitate toward big, bold domestic flavors--Napa and Columbia Valley mainstays like cabernet sauvignon, merlot, syrah, petite sirah and occasionally varietals like zinfandel and cabernet franc. The great thing about wine is that, despite that sounding somewhat narrow, there are actually hundreds, if not thousands, of wine options. But I'm always willing to branch out. In December, while dining at Lupa, an Italian restaurant in Greenwich Village, Chris and I enjoyed some pretty amazing Italian wines--a big, bold Barbaresco, Casacina Bruciata 2007, and a Nero d'Avola, Frappato Firriato "Harmonium" 2008. They were both good, particularly the Nero d'Avola. 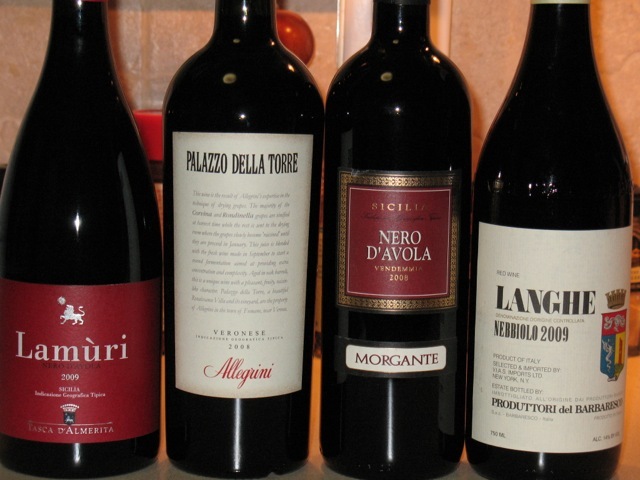 It made me think I should make an effort to further explore Italian wines. Falesco Pesano Umbria Merlot IGT 2009 ($16). Full-bodied and smooth with a balanced flavor that's both earthy and fruity with a smooth finish. I thought there might be some Cabernet Franc blended in, but the label says it's 100 percent Merlot. I enjoyed this wine, although I wasn't blown away by it. Poggio San Polo - Rubio Montalcino IGT 2009 ($16). This is a Tuscan sangiovese wine. Not quite as full-bodied as I like for wine, but it has a soft berry, fruity flavor. Not a bad wine, but not something I would buy again. Planeta La Segreta - Rosso 2010 ($13). Full-bodied flavor but soft on the palate makes this a nice choice to pair with cheese. There's definitely berry notes, but overall richer flavor than the other wines. Although it claims to be Nero d'Avola on the label, it's actually a blend of half Nero d'Avola, 25 percent Merlot, 20 percent Syrah and 5 percent Cabernet Franc. Not as outstanding as the Nero d'Avola we had at Lupa, but the best of the Italian wines so far. Produttori del Barbaresco Langhe Nebbiolo DOC 2009 ($24). This wine is notably lighter in color than the others, but thankfully not too light on flavor. It's certainly smooth, but not particularly memorable. This wine is from Piedmont, a northern region. Morgante Nero d'Avola Sicilia IGT 2008 ($17). This Sicilian wine is dynamite good. The best of the lot. Nero d'Avola was the varietal in the Harmonium wine we so enjoyed at Lupa, so I was excited to find a bottle locally that I also enjoyed. Remarkably, it's quite different from the Harmonium. While that wine was rich and full-bodied with hints of vanilla, this is softer, jammy even, but still very robust, especially after the bottle had been open a couple hours. Tasca d'Almerita - Nero d'Avola Sicilia Lamùri IGT 2009 ($18). When I picked up the Nero d'Avolas, the clerk who helped me pick them out said that the Morgante is bigger "old world" style, while this is a softer style more akin to a pinot noir. True to his word, this was notably softer, but had a lot of the same flavors. Also quite good, although I prefer the Morgante. Allegrini - Palazzo della Torre Veronese 2008 ($20). The bottle text explains that this is made with some dried grapes to give is a "raisiny" flavor. I was afraid this meant it was sweet, but it's not. It's really quite good with a nicely rounded full flavor. This is vying with the Morgante as my favorite.